Hooray! It's that time again! Spring has been a long time in coming to Michigan. Quite a long time this year. We keep getting a few warm winds, hopes soar, only to be dashed by yet another cold front. This weekend was a perfect example! Weather prediction, slightly overcast, mid to upper 60's. Reality: perhaps the temperature rose to 45 degrees, cooooold blustery wind and no sun. The only "burn" anyone had to fear was wind burn. I'll not be discouraged; balmy, sunny weather has to be right around the corner. All thoughts here at the homestead are optimistically turned to that glorious day just over the horizon...when we open our in ground pool. I've even caught our Lab looking at the covered pool, longingly. Inside, where it's warm, preparations have already begun. and Mom, taking stock of the all important stores of sunscreen. As one might imagine, we use quite a bit of sunscreen. One of the banes of my stocking duties is ensuring that we have appropriate stores for everyone, from my red-headed husband's sensitive skin, to the even more delicate exterior of my young nephews to lighter coverage for the sun worshipers. 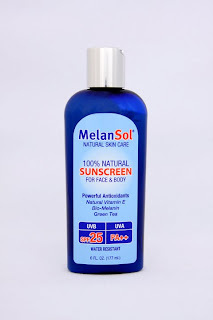 I was thrilled to be given an opportunity to test Melansol, 100 % Natural Sunscreen! MelanSol is formulated to keep your skin safe in two ways. It not only employs zinc oxide to reflect the sun's harmful rays but also includes natural anti-oxidants to combat the build up of free radicals on your skin from exposure to UV rays. The free radical molecules are the cause of sunburn and skin damage that leads to skin cancer. Does MelanSol really contain only natural ingredients? MelanSol welcomes questions from consumer's about their product and about sunscreen in general. Questions from readers may be left in the comment section of this post and will be forwarded on to a MelanSol Sunscreen expert or individually submitted at info@PureSunscreen.com. I'm thrilled to have found a quality, safe choice for all my swimmers in MelanSol! You can purchase 100% Natural MelanSol Moisturizer or MelanSol Sunscreen, SPF 10, 25 or 30, directly from puresunscreen.com with free shipping on all orders, including international, on orders over $50 or from this list of retailers. MelanSol is generously offering my readers a chance to win their choice of MelanSol product to protect their skin naturally! Winner may choose from 6fl oz bottles of 100% Natural Moisturizer ($16.95) or 100% Natural Sunscreen in SPF 10 ($20.95), SPF 25 ($23.95) or SPF 30 ($28.95). This giveaway is open to all, ages 18+ and will end on Saturday, June 4th, 2011 at midnight, EST. The winner will be selected randomly from all eligible entries and notified by email. The winner will have 48 hours to respond before I must move on to a runner up. Please leave your email address in your entry comments, in anti-spam format, if it is not available via your comment name, so I may contact you if you are the winner. * You must follow That's What She Said via Google Friend Connect (mid right sidebar) to be eligible to enter this giveaway. For mandatory entry, visit the MelanSol website, www.puresunscreen.com, and tell me in a comment something you learned about sunscreen or skin health or MelanSol there. * "Like" MelanSol on Facebook, leave a comment here with your Facebook name, 2 entries. * "Like" That's What She Said on Facebook and "like" the Melansol post on my wall, leave a comment here with your Facebook name, 2 entries. 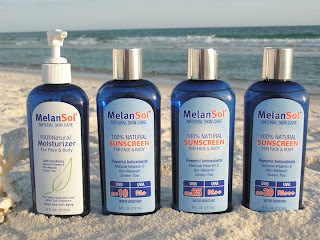 * Follow MelanSol (PureSunscreen) on Twitter, leave a comment here with your Twitter name, 2 entries. * Follow That's What She Said (tsue1136) on Twitter, leave comment here with your Twitter name, 2 entries. Leave comment here with your twitter name. Limit of 3 tweets per day. 1 entry per tweet. * Share this giveaway, with a direct link here, in some other fashion. Anything goes. Blog it, post to your Facebook, Stumble, Digg, Technorati, add to giveaway linky. Leave a comment here with a link to your sharing. 3 entries per each sharing. * Enter any of my other active giveaways and leave comment here letting me know which. 3 entries per additional giveaway. * Subscribe to That's What She Said via email or RSS feed (mid right sidebar) and leave comment here with your applicable name and method. 2 entries per subscription. * Tell me in a comment what your family loves to do on sunny summer days, 2 entries. * Tell me in a comment your tips for staying safe in the sun, 2 entries. * Have a question for the folks at MelanSol? Leave it here in a comment. 2 entries. ON BEHALF OF MELANSOL AND THAT'S WHAT SHE SAID, THANK YOU TO ALL ENTRANTS FOR PARTICIPATING AND FOLLOWING! I was provided with MelanSol products to explore for the purposes of creating this feature. The giveaway prize is provided by and shipped by MelanSol. Information and images taken from various MelanSol websites. The opinions expressed above are both honest and my own. Blue Sky image. Pool image. I learned that the sunscreens are biodegradable. current gfc follower as "sswpss" & I learned that Chemical sunscreen was found in breast milk! That's why MelanSol has natural, safe ingredients. 1. On Sunny days we like to go to the pool! 2. On Sunny days we like to go to the pool! I learned that Sunscreens Cause Coral Bleaching by Promoting Viral Infections. Following your blog! (ksyshenka) and I have learned that The cornerstone of each MelanSol® formula is a complete "system" of antioxidants. Super antioxidant Bio-Melanin (date fruit extract), in combination with mixed natural vitamin E and Green Tea, allow you to safely enjoy the sun because they act "synergistically" to continuously capture and terminate free radicals that form on your skin. #1 I Like MelanSol on Facebook and leaved a message on their wall! #2 I Like MelanSol on Facebook and leaved a message on their wall! #1 I friended you on Facebook and "like" the Melansol post on your wall! #2 I friended you on Facebook and "like" the Melansol post on your wall! #1 I entered Etienne Perret Innovative and Eco-Friendly Jewelry Giveaway! #2 I entered Etienne Perret Innovative and Eco-Friendly Jewelry Giveaway! #3 I entered Etienne Perret Innovative and Eco-Friendly Jewelry Giveaway! #1 I subscribed to your blog via email! #2 I subscribed to your blog via email! #1 My tips for staying safe in the sun are simle: first one is trying to avoid stay long in the sun and second one is using Sunscreen cosmetics! #2 My tips for staying safe in the sun are simle: first one is trying to avoid stay long in the sun and second one is using Sunscreen cosmetics! Could you advice me please about the necessity of using Sunscreen cosmetics in the Winter period! I've learnt that the cornerstone of each MelanSol® formula is a complete "system" of antioxidants. 1/ Already your FB friend Yuliya Sh and commented on the post. 2/ Already your FB friend Yuliya Sh and commented on the post. I follow and I saw that they have a 10% and a 25% SPF version. The SPF-30 is more water resistant than our other formulas, so it will stay on longer while you (or your children) play in the water during the hot summer months. Its also a great selection for avid sport enthusiasts who spend extended time outdoors, and very fair skin that burns easily. "Like" That's What She Said on Facebook and "like" the Melansol post on my wall, leave a comment here with your Facebook name, 2 entries. 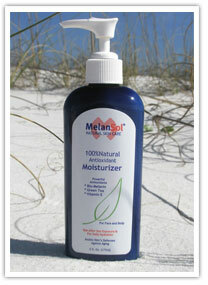 I learned that MelanSol is 100% natural and hypoallergenic, which is great for the sensitive skins in my family! On Sunny days we love to go rollerblading! In fact, we are going out this afternoon! I went to the website and learned the first ingredient in all the sunscreens is water, and that I could read most of the ingredients and understand what they are! Yay. i have leared that use of chemical sunscreen can even effect the breast and melansol is 100%natural and chemical free. liked your page on fb but did not dind the post. iked your page on fb but did not dind the post. I follow via GFC as Tracy Taylor and I love this: MelanSol® formula is a complete "system" of antioxidants I think that is SO important myself! there is a stream of fresh and cool water near our house.on sunny days we like to go there and play in water. here is a stream of fresh and cool water near our house.on sunny days we like to go there and play in water. potato juice is good to save from sun.yes potato!!! i learned that Lanolin Oil is one of the ingredients. I learned that "Every ingredient in MelanSol® sunscreen has been selected because of its ability to help your body repair and rejuvenate. The formula conditions, nourishes and hydrates as well. 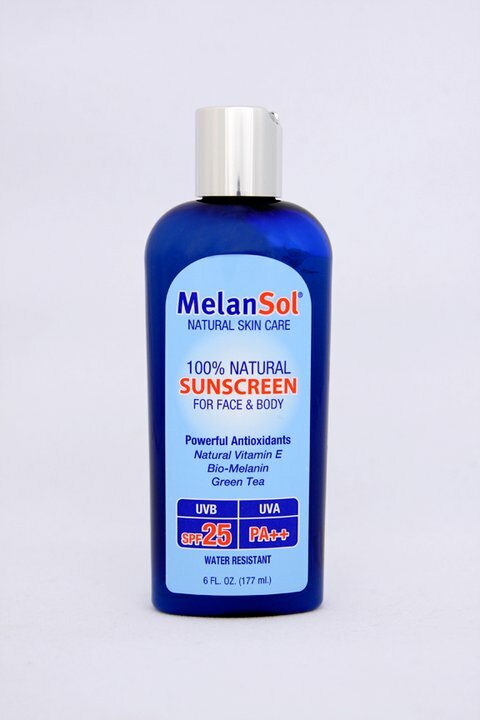 Most importantly, MelanSol® 100% natural skin care supports your cells with protection against skin cancer." I like That's What She Said on Facebook.